Phew that last post had more views than any other post I’ve written. I’m not going to lie – I almost quit blogging just to make sure I end things on a high note. I don’t want to let the success go to my head, but I’m curious – how do I go about getting paid for that post? Will someone be sending me a cashier’s check? Is it via direct deposit, or ? If someone could let me know, that would be great. Actually I haven’t been blogging because I’ve been attempting to be productive in other areas of my life. I know – it’s weird for me too. I’ve fallen victim to the gardening trend and am trying to start one. 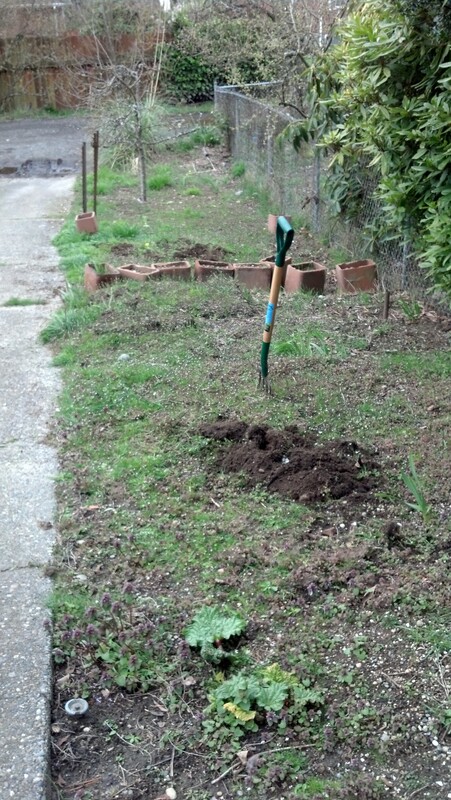 Right after I finish pulling out the ten million weeds that have taken over this hellacious plot of dirt. My back hurts just thinking about it. I was asking my husband some gardening questions the other night, which were apparently so dumb he thought I was joking. Am I the only person who didn’t realize that a pea seed would look like a pea?? Don’t answer that. And I’ve been working on my drawing skills. 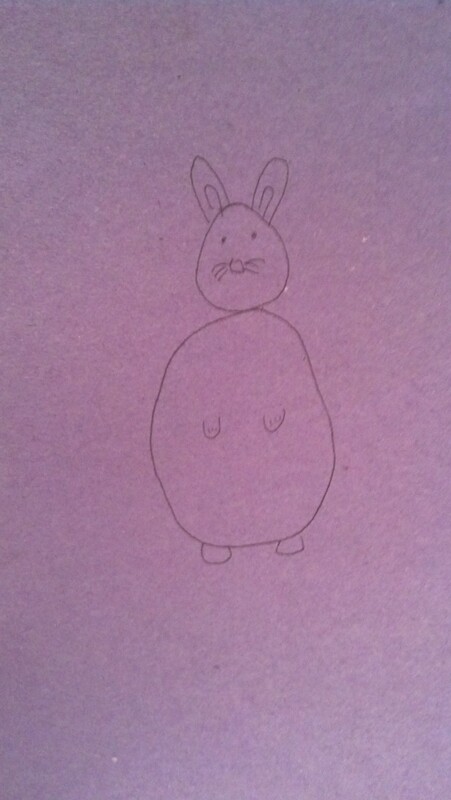 On Easter I made this rabbit. Those were supposed to be paws, not breasts. I’ll keep practicing. I’ve also been spending time outside enjoying an unusual stretch of sunny weather that makes me giddy. Mmmmountains. But the real cherry on the cake of my achievements is again related to sewing. I know – it’s weird for me too. 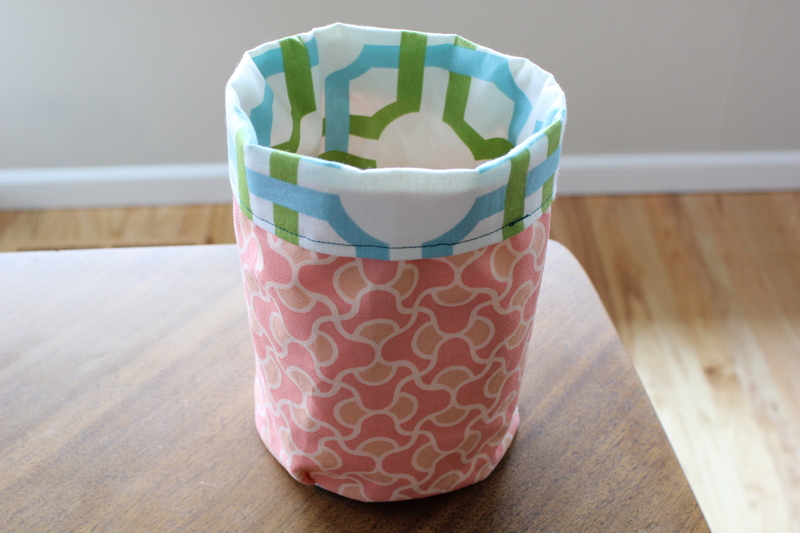 I found this cute project for fabric toy bins. I thought I’d give it a shot. Dare to dream, you know? I bought remnants at the fabric store – which, incidentally, is my new favorite hangout. The ladies who buy fabric on a Wednesday afternoon are the chattiest crew in town. And one of the saleswomen looks exactly like my grandmother. It’s uncanny. 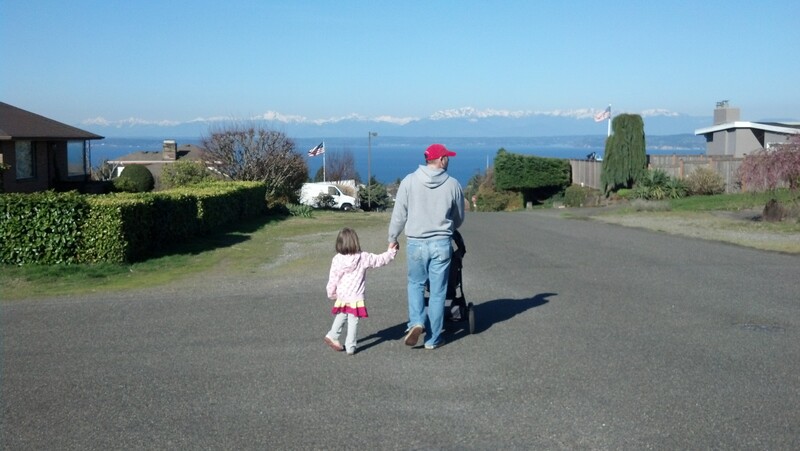 I wanted to stick her in my stroller (she would fit) and take her home. I still might. I stared at the fabric for a week. Then yesterday while my daughter napped and my other kid made curtains for her dollhouse, I fired up the sewing machine and went guns blazing and made this! I mean, seriously. Isn’t that cute?? Here’s another angle because I know you are curious. That thing has lining, yo! And like, a whole bunch of stitches and stuff! I am so impressed with myself I can barely stand it. Notice that the grainy photos of my family are taken with my cell phone, but I pulled out the nice camera to capture the color and magic of my Fabric Bin. Next I’m going to make a bigger one for bigger toys. Then I’m going to make a set we can use for soup bowls. 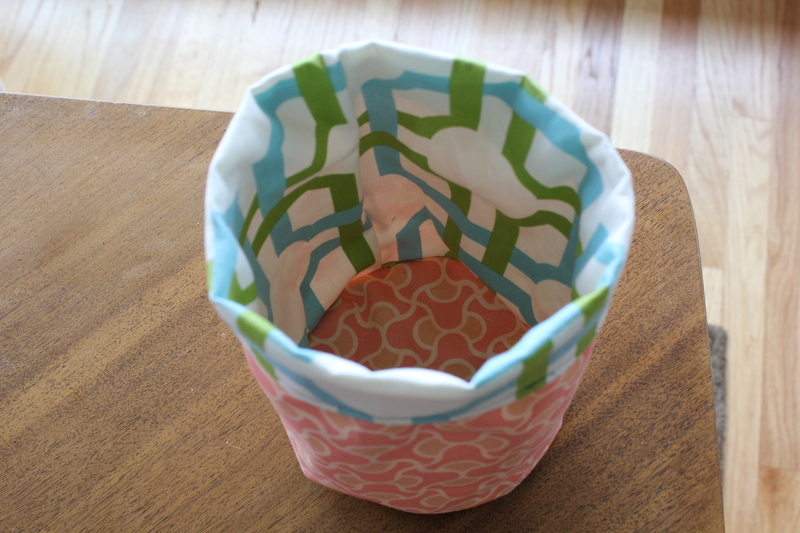 Christmas 2013: The Year I Gave Everyone a Fabric Bin. My newfound interest in crafty things continues to creep me out a bit, but if I have some sort of innate talent – which, who are we kidding, I must* – then I figure it’s my duty to share it with the world. In the meantime this bin has been put to excellent use. 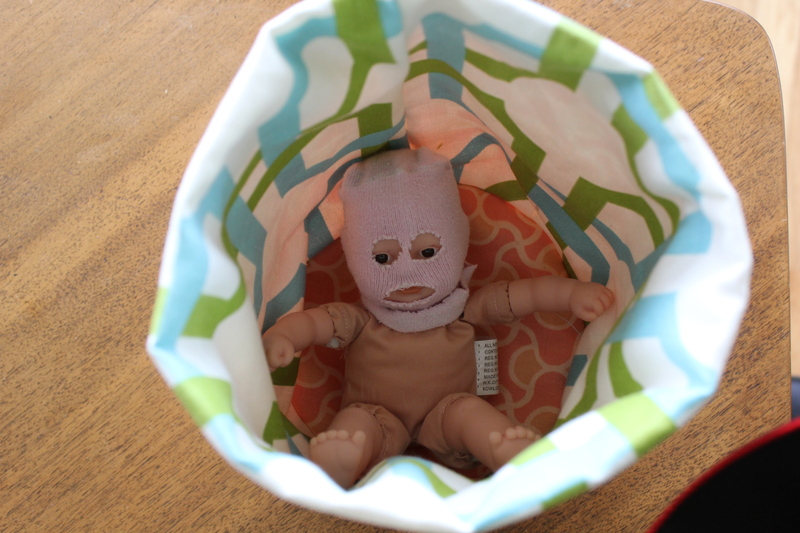 This entry was posted in Uncategorized and tagged Creepy Baby, fabric bins, gardening, sewing, what the hell is happening to me by BananaWheels. Bookmark the permalink. These are great! I think I need some bins. When will you make the tutorial? Youtube is calling…. Seriously you could put a bunch of your paint brushes in one of these little ones. Or utensils. Or bananas…so many options. Bins – plural (birthdays too). The baby doll’s baaaaaack! I love her so. I don’t have a ton of experience in the popular post department, but I will say I was wondering if there was a way to just leave that post on my main page forever. So that anyone who visits my blog will think I’m famous and swell, instead of seeing the vast majority of my turdy posts where only my sister comments. Oprah is definitely going to call you. I can feel it.